Google's Analytics is a great tool to monitor blog traffic, however to a completely new user it can be a difficult to use. To overcome this problem, Blogger has introduced a new feature to monitor a blog's traffic using a feature called Blogger's Stats. 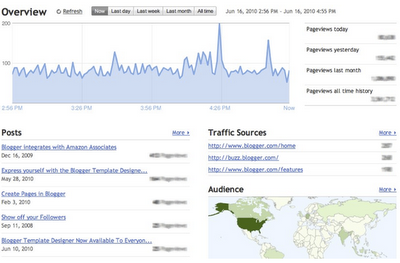 Blogger stats is currently available only on Blogger Draft. The statistics include posts that are visited the most, the traffic sources and the audience i.e. a map showing from which countries users are coming to your blog. Also you can see the number of visitors on a daily, weekly and monthly basis. Also it has advanced features like Pageviews by Browsers. You can get an idea which operating systems and Browsers your visitors are using. The important thing here is what you see is also seen by Google. But that is a small trade-off considering the power given to a blogger, and that too for free. It is still in the beta phase so don't expect it to be as accurate as Google Analytics, however for a beginner it is a gift. How do I enable Blogger Stats for my blog? Just visit Blogger Draft and select the check-box Make Blogger in Draft my default dashboard.